Lieutenant General Suresh Sharma took over as Engineer-in-Chief of the Indian Army today (01 Feb). 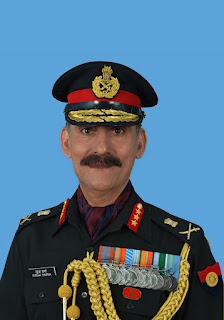 In his capacity as Engineer-Chief, in addition to steering the Corps of Engineers, he will serve as the Principal Advisor to Chiefs of Army, Navy, Air Force and the Ministry of Defence on all matters pertaining to engineering works services, being head of Military Engineering Services (MES). The General Officer commanded an Engineer Regiment during Operation Parakram and has held key operational logistics appointments in an Infantry Brigade along the Line of Control and an Infantry Division & Strike Corps in the South Western Theatre. He was assigned to the United Nations as an Advisor and served as Chief Operations Officer of the Mission in Bosnia & Herzegovina. Within the Corps, the General Officer has commanded the Bengal Engineer Group and Centre, a premiere training institution, and tenanted the appointments of Chief Engineer (Indian Navy & Coast Guards) Mumbai Zone, Chief Engineer South Western Command and Director General Combat Engineers at the Army HQs. Prior to taking over as the Engineer-in-Chief, he served as the 24th Director General of the Border Roads Organisation (DGBR), where he provided direction and renewed impetus to number of strategic border area projects. Today, the BRO is a vibrant, effective and responsive government agency that stands tall in the pursuit of its vision. On 26 January 2016, the General Officer was awarded the Ati Vishisht Seva Medal (AVSM) by the President of India.